Let’s go back in time a few decades, shall we? If you wanted to start your own business back in 1985 — the year I was born — there were a lot of risks involved. You had to secure a brick-and-mortar location, acquire inventory, hire staff, and then advertise relentlessly through traditional channels. Some startups were successful. But statistically speaking, most weren’t. Of course, solopreneurship existed back then, too… for instance, some independent travel agents and bookkeepers worked out of their home offices. But getting the word out about your business — and competing with the big players in those respective industries — was a huge challenge. The internet has made the world a much smaller place, hasn’t it? The barriers to entry to launch our own online businesses are low — and as global economies fail and falter, the dream of running our own show has never been more desirable. The internet has allowed us to sell our products and services to buyers around the world with minimal — if any — startup costs. Another huge benefit of global connectivity is our unprecedented ability to share ideas with one another, which is exactly what I intend to do in this post. There are four key challenges all solopreneurs face, especially in their first year of business. Speaking from experience building my own online, service-based business, I want to address these four key challenges and offer solutions that can work for you, too. You’ll notice I began this post by addressing everything that we have to be grateful for… and that was intentional. Because without the right mindset, any business — online or offline — is sure to fail. So let’s begin by talking about the fear of failure. And listen — I get it. I left behind a six-figure day job to start freelancing. My friends and family thought I was nuts… and maybe they were right. If you’re good enough to make money for someone else, why would you ever doubt that you’re good enough to make money for yourself? Can you relate to the story he’s telling? If so, solopreneurship might be for you. It’s not a conventional career choice — but if you want what others can’t have, you’ll need to do what others won’t do. And on that point, I want to address one of the biggest concerns that new solopreneurs have… and that’s the belief that he or she isn’t good enough. But you don’t need to be an expert to get started — you can learn and hone your craft as you go. Remember, the internet made all the tools, information and resources you need just that much more readily available. The key — really — is just to get started. Commit to doing what you really want to do — you only live once, after all. Learn new skills in baby steps. Save up a few dollar before you get started, be as thrifty as possible in the early days, and cut back your personal expenses drastically until you start earning a regular income. Less steak — more beans on toast. Before onboarding a new client, I always have a number of questions for him or her. Do you know what I often hear? You don’t need a degree in marketing to understand the absurdity of that sentiment. No, everyone is not your target market. We need to get specific, otherwise we’re going to waste our time and money marketing to the wrong people. The same goes for your online solopreneurship. You need to get specific — in a hurry — about exactly what services or products you will be offering. Of course, you can make course corrections as you go… but if you try to be all things to all people, you are setting yourself up for failure. Focus on offering a single product or service to begin. Spend some time brainstorming… what specific problem does your product solve? Who specifically has that problem? Even if your product could potentially benefit numerous different groups of people — let’s say your product would be useful both to senior citizens and mothers of newborn babies — choose one group to focus on. For that matter, take it a step further… perhaps you will choose single mothers with newborn sons less than 7 months old who enjoy thrift shopping and live in Chicago. Now design your content and marketing strategy to address that highly targeted person. Also, never offer a service that forces you to operate in your weakest areas. Focus on what you do best — not necessarily on what you think will be the biggest money maker. I’ll be the first to admit that I struggled enormously with time management as a new freelancer… and not for the reasons you might think. See, most solopreneurs work from home. And as a result, the temptation to lose focus or get distracted is tremendous. After all, you are only a few feet from your television, and no one is telling you to stay put at your desk. For the people who struggle with keeping focused, I can’t help you. But the big reason I struggled with time management — as do many others — is the tendency to work a little too hard in the early days on relatively insignificant tasks. From tweaking the typography on our blogs to adjusting our email signatures to recording the perfect voicemail greetings, some of us are born perfectionists. And as such, we express our desire to succeed by leaving no stone unturned… even though there is $0 waiting for us beneath those stones. Have you heard of Stephen Covey? I’m sure you have. He wrote the 7 Habits of Highly Effective People and developed something called the Eisenhower Decision Matrix. 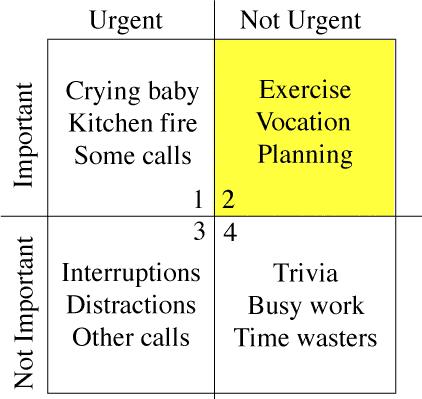 Most solopreneurs spend too much time on what we preceive as urgent tasks rather than the truly important tasks. Further, recent studies have shown the dangers of sitting in a stationary position for hours on end. After all, working from home can severely limit the physical movement we get in a day. And when we get busy, we tend to sleep less, eat more, read less, and stress more. Of course, none of these things are good for our physical or mental health. Poor allocation of your time makes you less effective and ultimately harms your business, even if you think that working 24-7 will help scale it faster. Are you focusing on income-generating activities, or are you simply keeping busy for the sake of being busy? Remember, you don’t need to be perfect. You’re a solopreneur. Focus on the big picture — not all the small details. And no matter how busy you may get, make time to sleep right, eat well, exercise, read, and spend at least a few quality hours with your friends and family each week. Schedule the important tasks first and save what you perceive as urgent tasks until later. I saved the best for last, didn’t I? Let me make something clear with this point… a successful solopreneurship does not mean you have to do everything yourself. Whether you are selling products or services, at some point — to keep growing — you are going to need to hire help. You might need to hire a salesperson, a lead generation team, bookkeepers, marketing experts, a designer, a translator… the list goes on. If you hire too soon, you risk eroding your hard-earned profit or — worse — the operating capital you need to cover an unforeseen expense. But if you wait too long to hire help, you could lose out on fulfilling a large contract simply because you didn’t have the available resources. So how do you know when it’s time to hire help…? My best advice is to keep your expenses as low possible for as long as possible. In the early days, do as much of it yourself as you can. For instance, let’s say your design skills are weak. Rather than hire a professional to design your Facebook cover photo, do it yourself… sure, it may not look original or eye-catching, but it’s better to hang on to every penny at first until you start earning some regular income. Ask yourself this… if you spend $50 to get someone else to do it, will you make at least an additional $50 back as a result? If the answer to that question is no, then do not spend the money. Put another way, you will earn more than $1.66 for every $1 you spend outsourcing this job. This is a rather linear and straightforward example… but try to think of other areas of your business the same way. Every dollar you spend should bring back in a dollar or more. The one exception is coaching… if you’re unsure where to begin, but you absolutely know you want to build your own online business, spend a few dollars on education. Education should always be viewed as an investment rather than an expense. 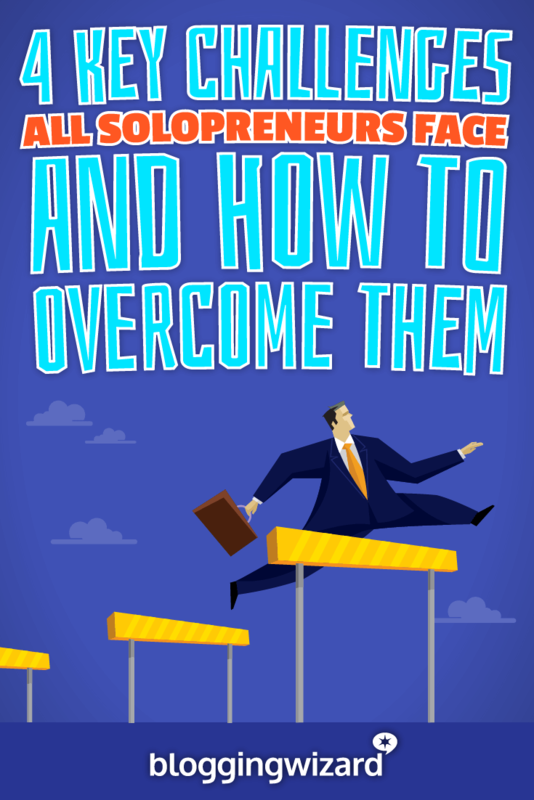 Of course, this list of four key challenges solopreneurs face and how to overcome them is not intended to be exhaustive. I recognize that there are hundreds — thousands? — of specific challenges we face every day. But, these are the main challenges most solopreneurs will face. So take things one step at a time. Identify your biggest challenge first and put a plan into action that will ensure you can overcome it. Then do the same for the next challenge. Soon enough, it’ll be plain sailing.